A VM or virtual machine was originally defined by Popek and Goldberg as "an efficient, isolated duplicate of a real machine." Current use includes virtual machines which have no direct correspondence to any real hardware. 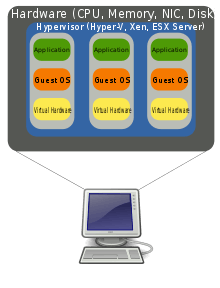 The use of virtual machines to support separate guest operating systems is popular in regard to embedded systems. A typical use would be to run a real-time operating system simultaneously with a preferred complex operating system, such as Linux or Windows. Another use would be for novel and unproven software still in the developmental stage, so it runs inside a sandbox. Virtual machines have other advantages for operating system development, and may include improved debugging access and faster reboots. Both system virtual machines and process virtual machines date to the 1960s, and continue to be areas of active development. System virtual machines grew out of time-sharing, as notably implemented in the Compatible Time-Sharing System (CTSS). Time-sharing allowed multiple users to use a computer concurrently: each program appeared to have full access to the machine, but only one program was executed at the time, with the system switching between programs in time slices, saving and restoring state each time. 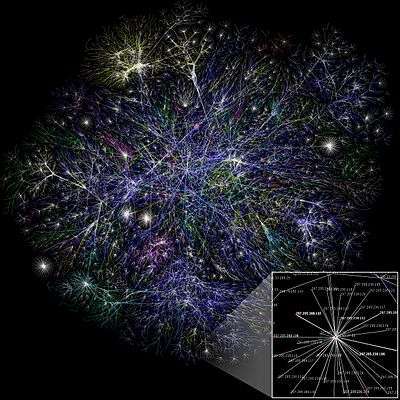 This evolved into virtual machines, notably via IBM's research systems: the M44/44X, which used partial virtualization, and the CP-40 and SIMMON, which used full virtualization and were early examples of hypervisors. The first widely available virtual machine architecture was the CP-67/CMS; see History of CP/CMS for details. An important distinction was between using multiple virtual machines on one host system for time-sharing, as in M44/44X and CP-40, and using one virtual machine on a host system for prototyping, as in SIMMON. Emulators, with hardware emulation of earlier systems for compatibility, date back to the IBM 360 in 1963, while the software emulation (then-called "simulation") predates it. Process virtual machines arose originally as abstract platforms for an intermediate language used as the intermediate representation of a program by a compiler; early examples date to around 1966. An early 1966 example was the O-code machine, a virtual machine which executes O-code (object code) emitted by the front end of the BCPL compiler. This abstraction allowed the compiler to be easily ported to a new architecture by implementing a new back end that took the existing O-code and compiled it to machine code for the underlying physical machine. The Euler language used a similar design, with the intermediate language named P (portable). This was popularized around 1970 by Pascal, notably in the Pascal-P system (1973) and Pascal-S compiler (1975), in which it was termed p-code and the resulting machine as a p-code machine. This has been influential, and virtual machines in this sense have been often generally called p-code machines. In addition to being an intermediate language, Pascal p-code was also executed directly by an interpreter implementing the virtual machine, notably in UCSD Pascal (1978); this influenced later interpreters, notably the Java virtual machine (JVM). Another early example was SNOBOL4 (1967), which was written in the SNOBOL Implementation Language (SIL), an assembly language for a virtual machine, which was then targeted to physical machines by transpiling to their native assembler via a macro assembler. Macros have since fallen out of favor, however, so this approach has been less influential. Significant advances occurred in the implementation of Smalltalk-80, particularly the Deutsch/Schiffmann implementation which pushed just-in-time (JIT) compilation forward as an implementation approach that uses process virtual machine. Later notable Smalltalk VMs were VisualWorks, the Squeak Virtual Machine and Strongtalk. A related language that produced a lot of virtual machine innovation was the Self programming language, which pioneered adaptive optimization and generational garbage collection. These techniques proved commercially successful in 1999 in the HotSpot Java virtual machine. Other innovations include having a register-based virtual machine, to better match the underlying hardware, rather than a stack-based virtual machine, which is a closer match for the programming language; in 1995, this was pioneered by the Dis virtual machine for the Limbo language. ↑ Oliphant, Patrick. "Virtual Machines". VirtualComputing. Retrieved 23 September 2015. Some people use that capability to set up a separate virtual machine running Windows on a Mac, giving them access to the full range of applications available for both platforms. ↑ Super Fast Server Reboots – Another reason Virtualization rocks. vmwarez.com (2006-05-09). Retrieved on 2013-06-14. ↑ "Server Consolidation and Containment With Virtual Infrastructure" (PDF). VMware. 2007. Retrieved 2015-09-29. ↑ A Comparison of Software and Hardware Techniques for x86 Virtualization, Keith Adams and Ole Agesen, VMWare, ASPLOS’06 21–25 October 2006, San Jose, California, USA "Surprisingly, we find that the first-generation hardware support rarely offers performance advantages over existing software techniques. We ascribe this situation to high VMM/guest transition costs and a rigid programming model that leaves little room for software flexibility in managing either the frequency or cost of these transitions."